What is it about the holidays that makes us want to be close to family? Close enough to beat them over the head with a turkey drumstick anyway. I would argue it’s the food. All our problems began with food. We were cursed after Adam and Eve ate the forbidden fruit, yes. But more salient to this discussion, the first marital spat then ensued over who caused whom to blow their specific-fruit-free diet. One brother stabbed the other in the back when the Father liked the food he brought to the table better. The Israelites complained about nothing more than the lack of food variety in the desert. And early Christians bickered over what foods were okay with God to eat. Today, everyone seems to have their own diet: organic, vegan, raw, allergy-free, clean, low-carb, low fat, sugar-free, two-year-old (only what you don’t want me to eat) and my dad’s favorite–seefood (you eat only what you can see). While it can be annoying to accommodate all these preferences and necessary restrictions, the friction we have about food in our families isn’t really about the food. But you just said it WAS about the food. I know. Irritating. If I were your family member, I’d give you plenty of reasons to come after me with that drumstick. It’s NOT about the food, but we act as though it is. Why? It’s easier to gossip about Aunt Ginny bringing one can of corn to the feast than it is to admit she’s disconnected from the family, much less to wonder why. It’s easier for your sister-in-law to complain about your cooking than it is to admit she’s incredibly jealous of you. It’s easier to complain about the food being cold than it is to talk to your brother about showing up late for every gathering. Food becomes a displacement for hurts and hostilities that are too threatening to admit or deal with. Remember that next time someone asks you to stab them a potato. There may be no food more subject to personal preference than stuffing. You love it, you hate it. You make it from a box or from scratch. You have regular, cornbread, or gluten-free. You put in giblets, sausage, cranberries, or none of the above. You drench it in gravy or you don’t. And most people think their stuffing (even if that’s NO stuffing) is the best stuffing. Why? Because stuffing represents the holidays and holidays represent family and deep down we’re all still little kids who believe my-dad-is-bigger-than-your-dad and my-mom-cooks-better-than-your-mom and we’re willing to get a black eye to prove it. How do you feel if I tell you that my mother’s stuffing recipe is hand’s down the BEST stuffing ever? As you scan down to check out the recipe, I know what you’re thinking. 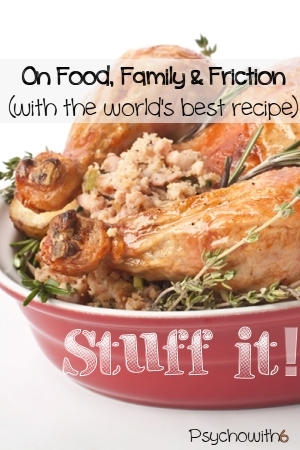 You’re thinking that YOUR (family’s) recipe is better or that I’m stupid to even eat stuffing. Am I right?? Am I, huh? Tear up bread and leave out overnight to dry. The next day, preheat oven to 350F. Grease or spray one oven-proof, deep casserole dish if you plan to stuff your turkey or two dishes if you don’t. Saute celery and onions in butter until almost transparent. Meanwhile, put Stove Top stuffing, sage, and eggs on top of stale bread. Add sauted onion and celery. Warm 32-oz chicken broth on medium heat and pour on top of bread and mix well. Add additional chicken broth until it’s soupy. You’ll think it’s too watery, but if you bake it without enough liquid, your stuffing will be dry. If you plan to stuff your turkey, first make sure the stuffing and turkey are the same temperature (both warm or both chilled). Bake stuffing for one hour, covering with foil the last 20 minutes. You can’t control whether a family member forgets the rolls, whether Uncle Dave has a few too many, or even if your mother-in-law makes a nasty face when she bites into your dish. But you can control YOU and that’s a lot. Don’t Confront at the Holidays. Thanksgiving and Christmas are a little like weddings. Most people wouldn’t think of starting something with the bride before she walks down the aisle. Why? Because all her hopes and dreams are pinned on that day that she will remember forever. Your family has high hopes for happy holidays, too, and they are remembered like no ordinary days. Do you want everyone to remember the Christmas of 2012 as the one where you finally lost it and told the big mouth off and sent her running in tears to her car after having too much to drink in a snow storm… You get the idea. Save any necessary confrontations for a less emotional time. Keep Your Expectations Under Control. We’d be better off watching the beginning of A Christmas Carol than the end before a family holiday. Unfortunately, people aren’t on their best behavior at this time of year; they’re usually at their worst. They’re tired, stressed, strapped for cash, bombarded with the temptations of food and alcohol, and feeling pressured to eat someone else’s substandard stuffing (i.e., yours). Instead of envisioning a scene of peace and joy, imagine you’re walking into a room of toddlers who’ve gone without a nap. If you get out of there without raising your voice or hitting someone, you’re doing well. Avoid Resentment. 1 Corinthians 13 says that our good deeds are worthless without love. If you’re going to be bitter about hosting the holiday ONE MORE TIME or if it makes you crazy that your lovely homemade gifts aren’t appreciated, don’t do it. Avoid doing or giving anything that will make you resentful. Romans 12:18 says as much as possible, as far as it depends on you, to live at peace with everyone. Sometimes that requires avoiding someone. Keeping suggestion #1 in mind, either avoid seeing someone if it won’t create undue conflict or spend the majority of your time talking with people who don’t push your buttons. Create Your Own Holiday. Even if you’re single, you can plan a celebration to include the food, decorations, and mood of your choosing. Don’t limit yourself to a certain day either. Would you like to have a peaceful Thanksgiving meal with friends or with just your immediate family? Plan it for another time so you won’t mind as much if the family holiday itself isn’t all you hoped. Invite a Loving Family Member. Cain took it personally that God didn’t approve of his offering, but deep down Cain knew it was because he hadn’t brought what God asked. God absolutely loves your stuffing, even if that’s no stuffing at all. Invite Him to your holiday celebrations this year and you won’t even notice all the racket the relatives are raising. Spend extra time in prayer and worship, asking God to help you be on your best behavior. I know He will. I plan to take my own advice this year, but I want to hear from you. What do you do to make family holidays less stressful? Please share in the comments. very amusing, but sometimes too true. One thing for sure, you absolutely cannot please everyone. In the old days, if you didn’t like it, you just didn’t eat it. Which, I just found out about 40 years ago, my family didn’t like sweet potatoes and I fixed them every holiday. The main thing is/was is your father and I both did. See what I mean? The dad was the leader of the family and the holidays meant a lot to him as far as his favorite foods. I hope everyone has a wonderful holiday season! your post struck me funny later on this morning. When you were a little girl barely a year old, we usually had about 15-20 people for Thanksgiving. Our table was stretched out into part of two big rooms. I was always teased about how I set the table; potatoes on one end and gravy on the other. Thanks for your post it has kept me smiling most of the day! You’re making me hungry for mashed potatoes already! I think this will make you smile. The fast couple of days, I have discovered that my way of making stuffing is “rustic” cute huh? It is because I tear the bread instead of cube it. Whatever.